As a worried mother comforts her desperately ill son in Rio de Janeiro, the child's physician, Dr. Decosta, assures her that, thanks to the new night flying schedule of the Trans-Andean European Air Mail, which is being inaugurated that evening, they will receive a life-saving serum the next day. For a who’s who of 1930s cinema, we go to 1933’s Night Flight, a star-studded air-based drama. A polio outbreak in Rio leaves the doctors in need of medicine, as the town runs dry. They locate a supply in Chile and hire an air service to transport the serum to Brazil. Sounds simple, but circumstances collude to interfere with the journey. This is the initial flight for the night transport system, so it’s an untested run. The plane also encounters a severe storm that sends it off-course and endangers the mission – along with the lives of all involved. This DVD release of Flight received substantial attention because the movie had barely been seen since 1942. 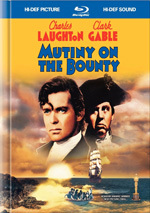 Due to rights issues, it’s essentially been out of circulation since then, so this DVD represented its initial screening for the vast majority of viewers. Plenty of movies haven’t gotten much play over the decades, so what makes Flight noteworthy? The cast. As I alluded at the open, the film provides a roster packed with the day’s biggest stars. 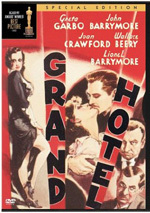 We find both Lionel and John Barrymore, Clark Gable, Myrna Loy, Helen Hayes and Robert Montgomery. That’s a group that accounted for 10 Oscar nominations and five awards (including an honorary one granted to Loy), so it certainly represents a lot of talent. Unfortunately, Flight goes down as a pretty big waste of all that talent. That doesn’t mean that I think it’s a bad film, because it’s not. Essentially an early entry in the disaster genre, the movie boasts some real strengths. Effects look shockingly good for their age; the flying scenes are relatively convincing, so they hold up well after almost 80 years. The flying elements also provide pretty nice excitement. These add spice to the movie and still give us thrills that satisfy. They’re restricted by the limits of those relatively good but dated effects, but they’re still reasonably solid and they make this a fun flick. So why do I deem it to be a waste of talent? Because this is essentially a light action flick that doesn’t need so many heavy hitters. You’ll notice that my plot synopsis fails to include any character names. I omitted them because they’re essentially inconsequential; the movie revolves around action and narrative, not characters. I won’t call them interchangeable, and the actors do fine in their roles, but Flight would’ve worked just as well with a less-notable cast. Of course, one could say the same about all those star-filled disaster flicks of the 1970s. I suspect Flight featured so many prominent actors for the same reason the 1970s films used that formula: their presence adds heft to otherwise insubstantial flicks. The performers give the movies a level of credibility that would be absent with less famous personalities. Flight may end up a victim of elevated expectations, though. It’s an inconsistent film, as it doesn’t balance its various characters and situations well, but it’s usually a fun one, so it makes for a breezy 85 minutes. However, when you find a movie that’s gone unseen for generations and that features some of early Hollywood’s biggest names, you anticipate something more than a zippy popcorn flick. If you enter Night Flight with hopes that you’ll discover a lost classic, you’ll feel disappointed. If you take it for the light entertainment it is, though, you’ll probably enjoy it. 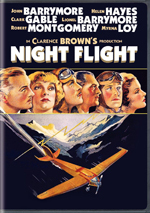 Night Flight appears in an aspect ratio of 1.33:1 on this single-sided, single-layered DVD. Due to those dimensions, the image has NOT been enhanced for 16X9 televisions. For a nearly 80-year-old movie, Flight looked okay, but the transfer rarely prospered. As expected, print flaws were a notable distraction. Some parts of the movie got off better than others, but a mix of specks and blemishes cropped up during the vast majority of the film. I will admit these weren’t bad for a release of this one’s vintage, though; most 1933 DVDs look far worse. Sharpness was also inconsistent but generally fine. More than a few soft spots emerged, but those weren’t extreme, and most of the movie showed pretty good definition for SD-DVD. Blacks looked deep and dense, and shadows were mostly nice. A few shots seemed a bit dense, but the majority demonstrated nice clarity. I wasn’t dazzled by this image, but it was perfectly acceptable for its age. I felt a bit less pleased with the film’s monaural audio. The movie came without notable source concerns – which ironically became a concern, as the quiet nature of the track seemed to stem from overuse of noise reduction. This takes away pops and problems but leaves us with audio that sounds sterile and flat. Everything here was perfectly listenable, but the lack of life was a problem. Speech was intelligible but thin, and the lack of volume made it tough to hear quieter lines. Effects were decent, with fair clarity, and the occasional snatches of music offered decent reproduction. This wasn’t a terrible track based on its age, but it’s too flat and quiet. Only a couple of minor extras appear on the DVD. We get two vintage shorts: a sports film called Swing High and an animated piece entitled When the Cat’s Away. The former concentrates on a circus trapeze act, while the latter gives us a “Happy Harmony” short with singing mice who party when the resident cat goes out to get laid. Neither offers a ton of entertainment, but they’re worthwhile for archival purposes. With a cast of legendary actors at its disposal, one might expect a classic from Night Flight. Instead, one will find a reasonably entertaining disaster flick; it’s enjoyable for what it is but doesn’t live up to its billing. The DVD provides erratic but generally adequate picture and audio along with two vintage shorts. Fans of 1930s cinema will want to give this one a look, but they shouldn’t anticipate more than a decent diversion.